The Organizer is many programs in one. With it you get a photo album, recipes book (professional version only), shopping and budget system, poems album, address book, all for free and you can create so much more quick and easy. Password protect sensitive photos. The Recipes Book contain a number of tested and tried recipes. You can also edit and add more favourite recipes to your heart's content !! Imagine searching for left over ingredients and up pops all the recipes that uses this ingredient. Better than searching thru' pages of cookery books and recipe collections !! The Photo Album is special. 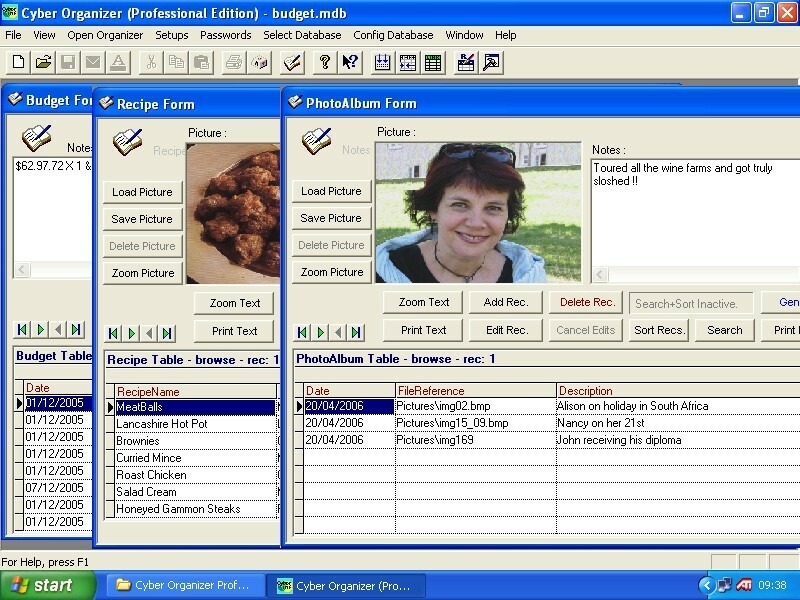 It allows you to add a reference, title and comments about the photos that you have inserted. This makes it so much easier to cross reference later on. In this new age of digital cameras and camera-cell-phones, the number of photos taken just piles up and later on gets dumped into a folder, never to be seen again. This photo album allows you, not only to load all your photos, but to describe them as well. Later on you can use the program's bulk e-mailer to post to family and friends !! If you are an insurance assessor imagine what an ideal package the photo album will be. Type up your notes or reports in line with the photos you have taken. The free Address Book is linked to the bulk e-mailer. Write one letter and post to all your family and friends. Paste photos from the photo album directly into your newsletter. The free Shopping and Budget setups contain auto totalling facilities. You can immediately see what the new totals are as you type your new entries !! If you are a sales person then send monthly news letters or post birthday wishes to your clients using the bulk e-mailer and the search and post facilty. There are simply so much you can create. For example : Additional photo albums for different categories. Lifedata holder containing pincodes, Id's, lock combinations.. Collection of D.I.Y. tips and sketches. The list simply is endless ! !